No. 8 by John Lawson is an upmarket restaurant offering modern Australian cooking using prime local ingredients in an urban setting. The restaurant is located in the Crown Melbourne, a multi-entertainment complex with a hotel, a casino, bars and a plethora of dining options including Nobu and Rockpool Bar & Grill by Neil Perry. As the name suggests, the Executive Chef of No. 8 is John Lawson. Essex born, Chef Lawson has worked in some notable restaurants including the two Michelin starred Le Manoir Aux Quat’Saisons, Aurora in London’s five star Great Eastern Hotel and Daniel Boulud’s three Michelin starred fine dining restaurant, Daniel. Chef Lawson was also part of the opening team for Gordon Ramsay’s New York venture at The London and was the Executive Chef at Maze Melbourne before it closed. 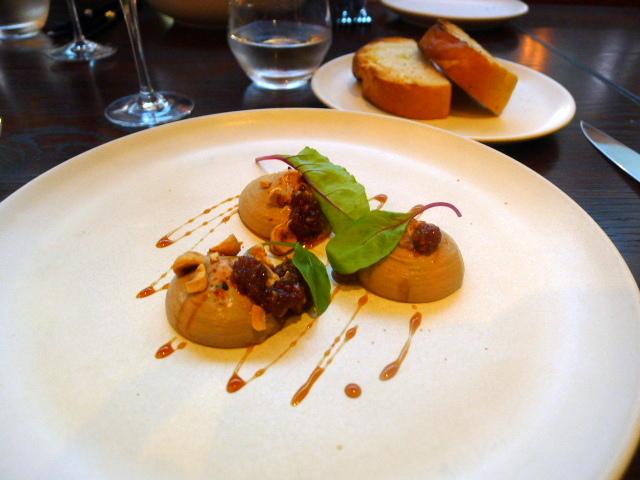 Our first starter was a foie gras and chicken liver parfait with sweet mulberries and toasted sourdough ($24 – about £12.90). It was beautifully creamy and flavoursome with the mulberries working well with the parfait. The bread was good, but some buttery brioche might have worked better than the sourdough. Two generous pieces of Portland black and blue tuna (£22 – about £11.80) had been gently seared and were thick, meaty and tasty. 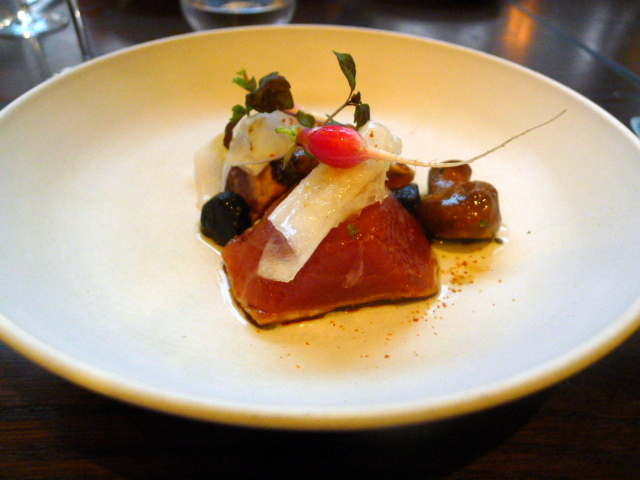 Accompanying the tuna was some black garlic, yuzu jam and aged soy which were pleasant. There were also slices of daikon (radish) for a touch of tang and some almond mushrooms, so called as they tasted like mushrooms soaked in amaretto. These added an interesting touch to the dish. 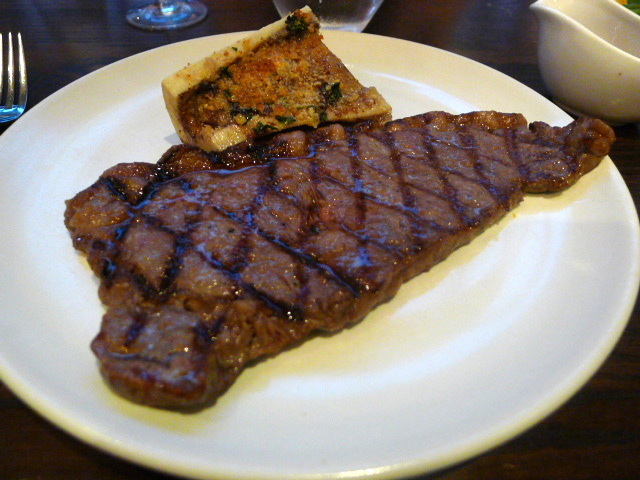 Darling Downs strip loin 9+ 300gm (£110 – about £59) was intensely flavoursome and oozed with gorgeous fattiness. The loin had been cut quite thin and although delicious, a thicker cut would have provided a fully texture in the mouth. Alongside the steak was a fantastic piece of bone marrow which came with a well seasoned crumb topping. The fish of the day was seared snapper ($36 – about £19.30) topped with powdered smoked egg and ‘salt fingers’ (a sea vegetable), and served with spinach and potatoes. 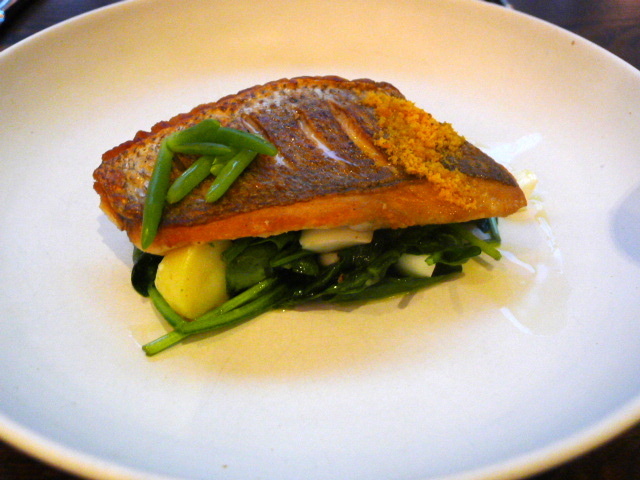 The fish was nicely cooked with a crispy skin. But there was no sauce on the plate, and even though the fish was reasonably moist, the overarching result was one of dryness on the palate. The bread was also worth a mention as it was gorgeous. Baked by artisan bakers EDS breads, the variety on offer was potato, rosemary and honey. It was super yummy with the softest and smoothest of textures. The accompanying seaweed butter was really tasty as well. 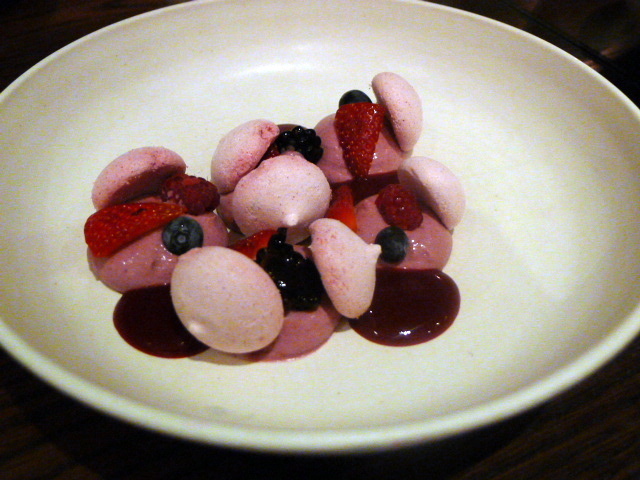 To desserts, and a neatly presented summer berry Eton Mess ($16 – about £8.60) consisted of nicely made pieces of blueberry meringue, a creamy berry custard and a mixture of deliciously sweet blueberries, raspberries, strawberries and blackberries. The finishing touch was a tasty raspberry coulis which rounded off this tasty dessert nicely. 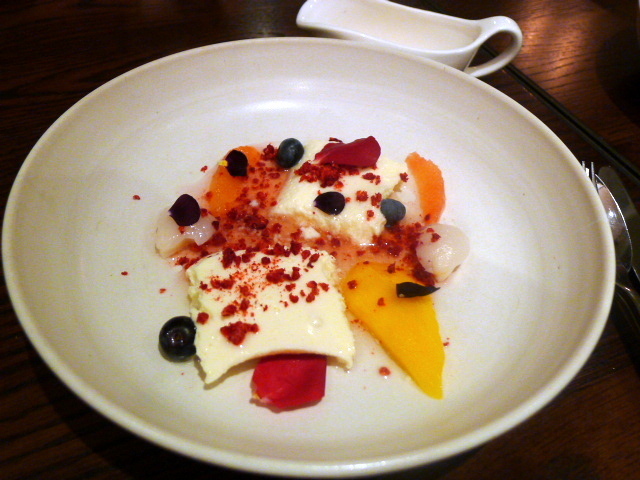 A yoghurt and honey mousse ($20 – about £10.80) was wonderfully creamy with a gentle hint of honey running through it. The use of fresh lychees, blueberries and mango was really refreshing. But it was lychee and rosewater syrup and the use of rose petals that gave the dessert a lovely fragrance and a hypnotic quality. 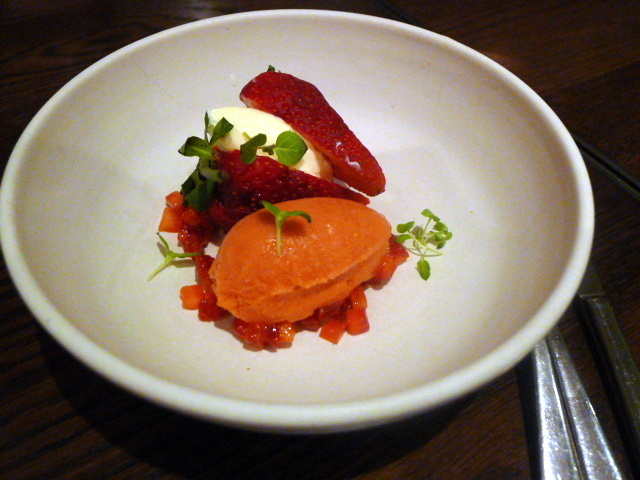 A third dessert of firm strawberries (£15 – about £8) with house clotted cream and a well made strawberry sorbet was also rather pleasant. The gorgeous desserts stole the show on this particular evening and demonstrated great skill in their preparation. The fish dish required some tweaking, but other than that we also enjoyed the savoury courses which proved what a solid performer No. 8 by John Lawson was. The service was convivial and relaxed as well to round of a rather pleasant experience. Prices: $67 to $154 (about £36 to £81) for three courses, excludes drinks and service.